Ben Nye's luxury face powders are micro-milled for a superior texture. Available in a range of shades to meet your needs for skin tone or makeup design, luxury powder will set your application, soften hard lines, and add a hint of color. 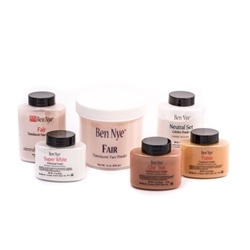 Necessary for any cream-based makeup application, make sure you've got some of Ben Nye's face powder in your makeup kit! Available colors include : Banana, Fair, Neutral Set, Super White, Pretty Pink, Topaz, Coco Tan, Sienna, Chestnut, and Ebony.